Fourteen Photoshop Brushes created from Artwork featured in the game Quake 3 arena. 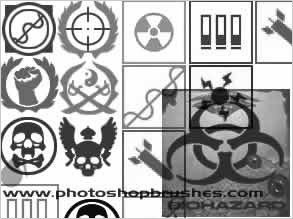 The photoshop brushes show icons used on the ammo pick ups and other skill icons used within the quake 3 game. Great little Icons that can be added to compliment many types of gothic styled or grungy artwork. There are more Icon Photoshop Brushes featured in my site. Also check out the Vector Shape Brushes which are also available for free download.